Web pages contain many different types of content including text, images, adverts, scripts and more. Strip out what is not needed on the iPhone to save mobile data and speedy web browsing. 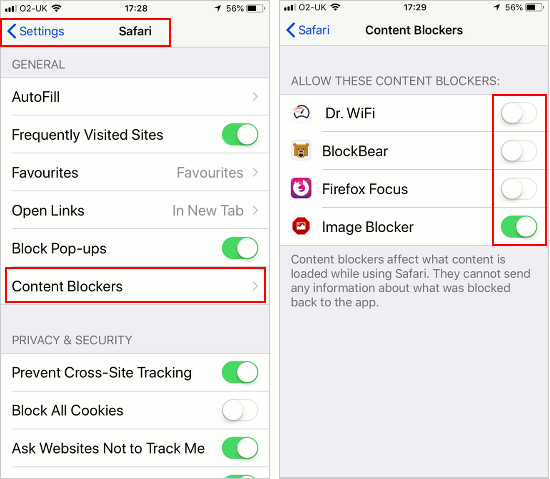 A content blocker is a special sort of extension for Safari on the iPhone and iPad and it acts like a filter, allowing some content through but blocking other types of content. A content blocker might block images for example and this means that web pages are faster to display because there are no bulky picture files to download. It would also mean that less mobile data is required to display a web page, which could be important if the data limit is quite low on your phone contract. Content blockers can also be used to prevent adverts from appearing on web pages, which again speeds up web pages and reduces data used. They can block tracking scripts used by advertisers and others to track you as you browse the web, which increases your privacy and anonymity. 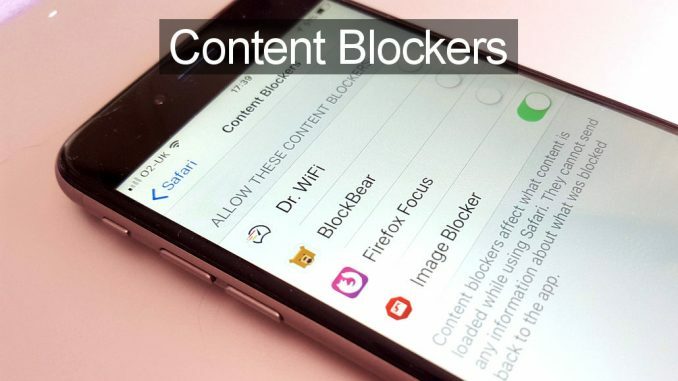 To enable content blockers in Safari on iOS devices you must first install some and I added Dr. WiFi, BlockBear, Firefox Focus and Image Blocker from the iOS App Store. All are free. To enable these apps, go to Settings > Safari > Content Blockers and turn on the switch next to the one you want. There is little point in having four doing the same job as I have and one is sufficient. However, all four can be installed and turned on and off in turn to test them. One other thing you need to do is open Safari and go to a web page. Press the Share/Activities button at the bottom of the screen and swipe left over the icons to reveal the More button on the right. Press it and then add the activities for the content blockers so they can easily be accessed. This is the simplest of the content blockers here and when it is enabled in Safari settings it stops images from being downloaded on web pages. It blocks adverts too, perhaps because most of them are images. Websites were faster to load when Image Blocker was enabled. Press the Share/Activities button and there is a button to whitelist the current website and allow adverts. (Add RAWinfopages!) However, the whitelist is ignored unless you upgrade to the pro version for US $1.99 (UK £1.99), which is pretty cheap. There is little to see in the app itself and almost no features or settings – it simply lets you add or remove websites to a whitelist. If all you need is image and ad blocking, it works ok. 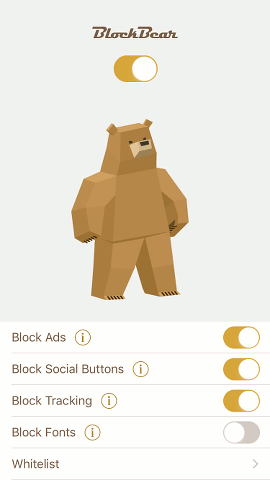 This app is by TunnelBear, the company that produces the VPN of the same name. Run the app and it has a master on/off switch at the top and below are switches to enable/disable adverts, social buttons, tracking and fonts. For some unknown reason it did not block anything at first. I turned the switches on, turned them off, enabled Content Blockers in Safari, disabled them, cleared the browser history, and so on. Then, on maybe the 10th time of trying when I had almost given up, it started working. Once it got going, it seemed to work fine and web pages loaded faster and without adverts. 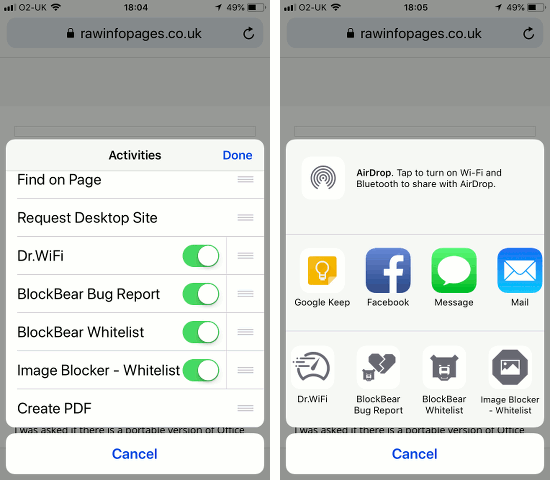 There is an option in the app to add websites to a whitelist to allow ads and other items on selected sites and there is a button on the Share/Activities menu in Safari to add the current site. There are more features than Image Blocker, but it was a bit temperamental for me. Firefox Focus is a web browser from Mozilla that it is based on Firefox, but it has extra privacy features built in. Open Firefox Focus and you can browse the web with greater privacy and tapping the gear icon in the top right corner enables the settings to be customised. 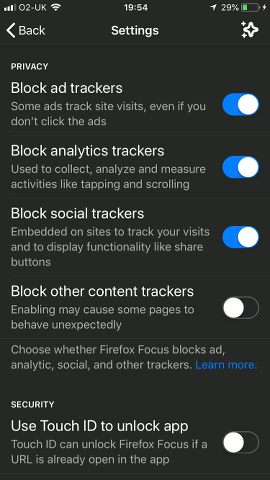 There are switches to block or allow ad trackers, analytics trackers, social trackers and other content trackers. 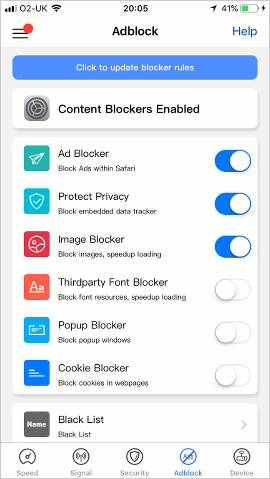 A Safari Integration button in the settings also enables Firefox Focus to block all these items when you browse the web with Safari, not just Firefox Focus. The browser acts as a Safari content blocker. It did a great job of cleaning up web pages and removing unwanted content and pages were much faster to load. You have a choice of browsing with Firefox or Safari and both are faster, ad and tracker-free. 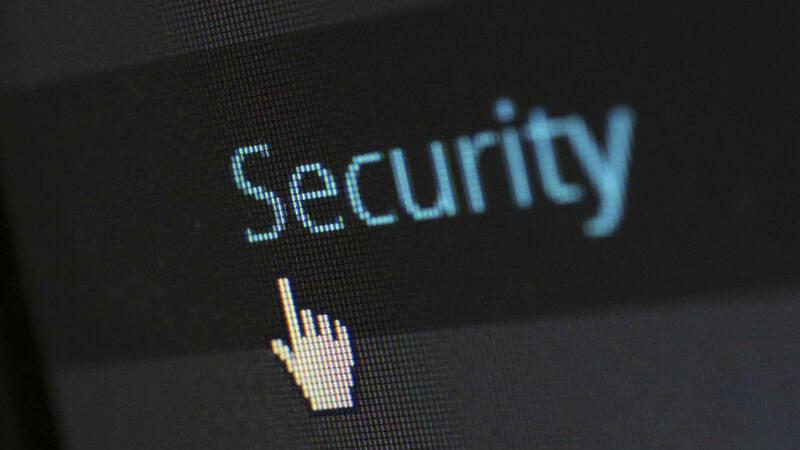 However, I could not see a way to whitelist websites to allow ads and other items – it is every site or no sites. Dr. WiFi is an internet and network speed testing app that measures upload and download speeds, measures your router ping speed, shows network devices and a few more things. Including content blocking in the app is a bit strange and does not really fit in with the rest of the features, but the app is worth considering either for the networks speed tests or its ability to block content in Safari. Open the app and tap the Adblock button at the bottom to enable it, and then also enable it in Safari Content Blockers. Return here and there are switches for Ad Blocker, Protect Privacy, Image Blocker, Third Party Font Blocker, Popup Blocker and Cookie Blocker. This has the most comprehensive range of features of all the apps on test and it enables websites to load faster and track you less. It also has a blacklist and a whitelist of blocked and allowed websites, so you can let your favourite sites (RAWinfopages?) show ads yet prevent bad sites from slowing down your browsing and using up lots of data. This is the best of the apps on test and is recommended.